'Number One' which is approached via an electric gated entrance, has beencompleted to a high specification by Shandler Homes to enhance today'smodern lifestyle living and is situated in this highly sought after location. Perfectly located within walking distance to Hadley Wood mainline station(which offers a regular service into Moorgate and Kings Cross with a journeytime of approximately 30 minutes), local shops, which include restaurants, ahairdressers, a newsagents and a health club. Cockfosters underground station(Piccadilly Line) is approximately 3 miles away as is junction 24 of the M25,which provides a link to all major motorway links and to all London airports. Hadley Wood golf course and tennis club are also within walking distanceand educational facilities in the area include Stormont, Lochinver, St John's,Haberdashers' Aske's for Boys and Haberdashers' Aske's for Girls, Mill Hill School,Aldenham, Belmont, Dame Alice Owen, Haileybury, Queenswood and QueenElizabeth's Girls and Boys Schools. 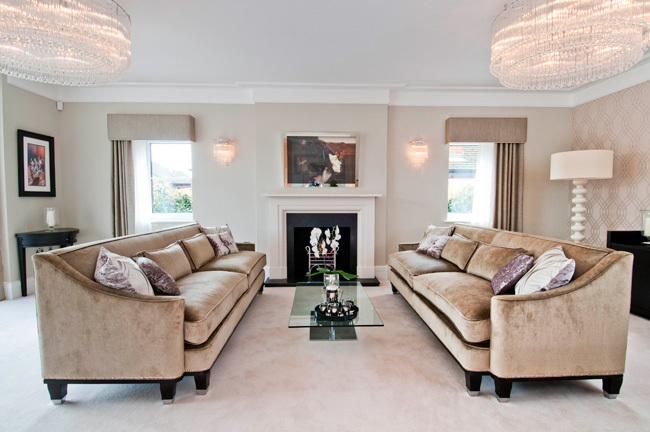 The master suite, cinema room, study, formal lounge,kitchen, morning room, dining room and family roomare fully air conditioned using a discreet system suppliedand installed by an established and well knownCompany. The eco friendly air to air pump, situatedunobtrusively outdoors, provides evenly tempered air tothe discreet linear grills enabling the air temperature tobe maintained to whatever level the user requires, hotor cold. 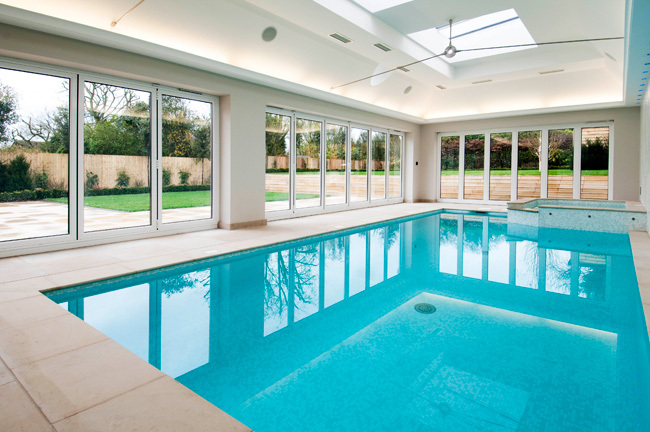 The pool complex has a state of art temperaturecontrolled environment matching the air temperatureto that of the pool which provides the user with a dryand clean even temperature atmosphere as well asminimising any condensation. 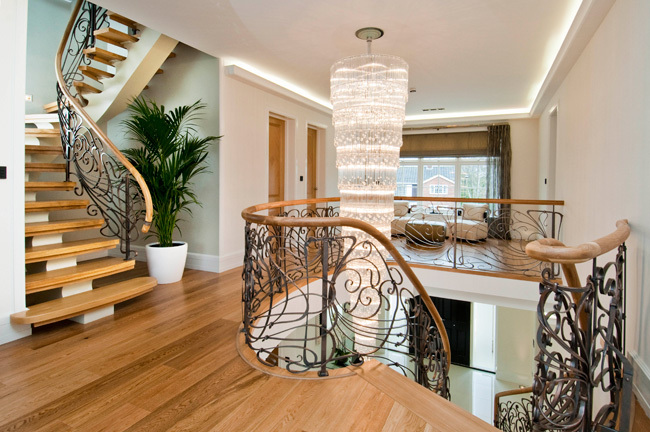 LightingAll lighting is centrally controlled via an iLight intelligentlighting control system. This allows the user to controlthe light in the home and enhance the character andfeature of every room. 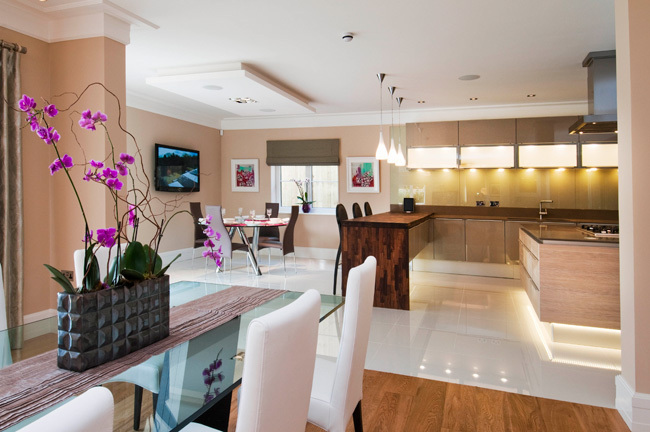 Several different settings can beprogrammed within any room to cater for different uses– dining, reading, entertaining or watching a movie. TV points throughout are connected to a distributed SkyHD, Digital TV and FM/DAB system allowing connectionof multiple Sky HD boxes, Digital TV's and FM/DAB radios. All points are pre-wired for a future centrally distributedHigh Definition Audio Visual system. With the simpleaddition of a suitable High definition matrix switcher,centrally located HD sources such as Sky HD & Blu-raycan be viewed on all TV's. Additional TV outlets havebeen pre-wired in the master bedroom allowing formultiple TV positions. The pool area for a future HDprojector and screen position. All main internal areas are fitted with Kef Ci Series ceilingspeakers giving a high quality evenly distributed sound,while the rear garden area has six Bose wide sound fieldexterior wall-mounted speakers. The Installed CrestronAmplification system allows up to 10 sources to belistened to in any area, this includes the fitted Nuvo twinDAB tuner and two Crestron iPod Docks. All Audio Visual systems can be expanded or modifiedusing the existing wiring infrastructure to suit any furtherrequirements. All Lighting and Audio Visual systems are controlledvia a Crestron Control system that is fully modular andadaptable to suit any further control requirements. Total Home Technology from Crestron streamlines andsimplifies all the technology in the home offering theultimate lifestyle of comfort and convenience. Crestron'saward-winning Total Home Technology Solutioneliminates the need to walk from room to room to adjustlights and audio/video components. Whether from aneasy-to-use colour touch panel, remote or a customizedkeypad, total control is always at your fingertips. 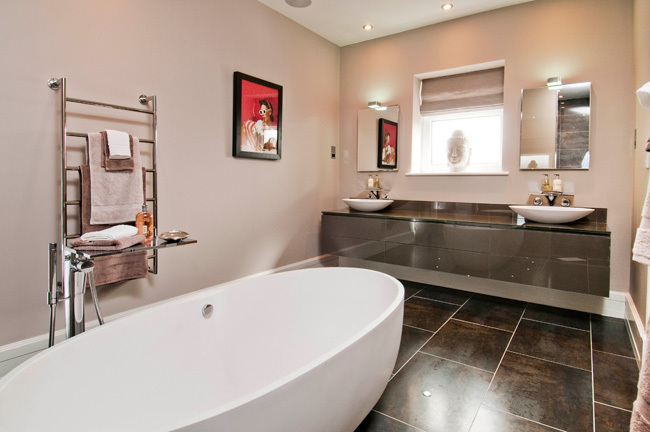 Renowned for supplying truly inspiring yet timelessbathrooms C.P. Hart has brought together Italian glassfurniture, composite free-standing baths and brasswarethat emulates the effect of a waterfall to create aluxurious sanctuary. 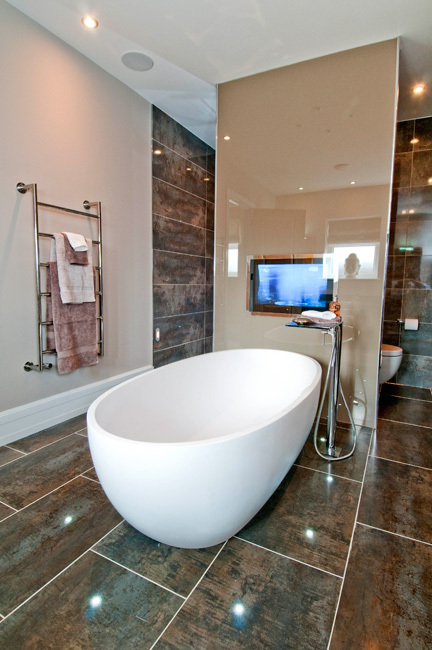 All bathrooms have been individually designed usingonly products of the highest standard, including sanitaryware by Duravit and Starck, and finished with a mix ofhigh quality ceramic and porcelain tiles. The chandelier you see in the entrance, and theunique pieces in the formal lounge are the creationof world renowned lighting designer Rocco Borghese.He is currently rated the world's number 3 glass artist/designer, and comes from generations of Murano glassartisans. Chandeliers of unique and artistic design arehis speciality. The two chandeliers in the lounge, and the four wallsconces feature a mix of frosted and clear glass,creating a wonderful cascade of shimmering handsculpted crystal pendants. The stunning piece in thegrand hallway carries through the theme beautifully.Each of these pieces shares the same jewel-likeluminosity as light dances through their glass forms.Every Borghese light is unique and made painstakinglyby hand. As well as a reflection of his own artistic vision,Rocco Borghese is passionate that each piece hemakes should fit perfectly within its surroundings. 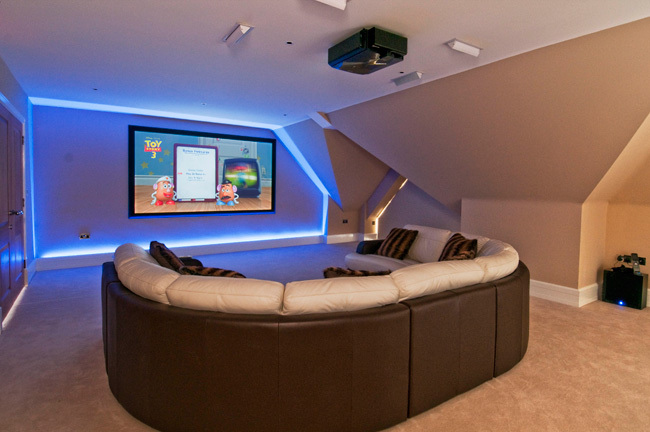 The dedicated Cinema room is fitted with JVC's newDLA -X3 Full HD 3D projector, displaying a 50,000:1native contrast ratio. The fixed 2.5 metre wide16:9 ratioprojector screen is acoustically transparent; hidingbehind it Kef's award winning Ci9000 ACE in-wallspeakers which are part of the motorised 7.1 surroundsound system. This is powered by Pioneers VSX-LX53Integrated 7.1 Channel HDMI AV Receiver which hasroom for 6 HDMI inputs. The installed Pioneer 3D Blu-rayplayer compliments the cinematic experience allowingonline content and the latest 3D blockbusters to beviewed in the comfort of your own home. Worktop: Caesarstone 20mm 4330 Ginger. "The subtle bronze tones of metallic gloss Cubanit fromthe latest Creative Accents collection contrast brilliantlyagainst deeply grained Sand Pine and smooth stoneworktops, highlighting the drama of bold architecturalshapes within a calm, sophisticated colour palette. Allthis is beautifully fused within the handless Segmentoand slim line poggenpohl kitchen." "The worktop from Caesarstone has an earthlybrown shade consisting of beautiful small quartz chipsblended to create a fine textured appearance, whichcomplements the design and colour of the kitchen." 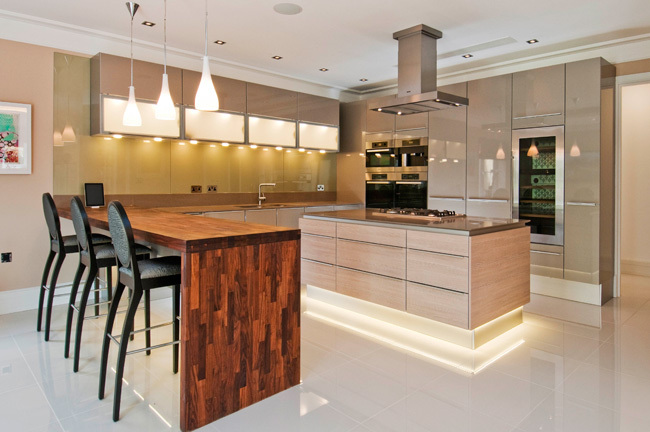 "The Spekva wooden worktop radiates warmth andcomes in walnut. N o two pieces of wood are identicalthus the various solutions SPEKVA offer makes eachindividual solid wooden worktop completely unique"
The planting at 1 Beech Hill Avenue is designed tocreate an interesting picture all year round with muchattention paid to evergreen plants and ones withspecific winter interest; Quercus ilex, Cornus 'MidwinterFire' and Skimmia japonica are the backbone ofthe scheme. These plants surround the property withgreenery and compliment its striking façade. All the plants in the gardens are completely hardy andwill survive year after year with only a small amount ofgeneral maintenance. Many can be cut to shape tokeep them at a size to suit all individual requirements. The boundaries of the gardens are planted with denseLaurel hedges and where more colour is requiredclimbing plants that provide interest through eachseason; Clematis for winter and spring, Garrya elipticafor all year leaves and interesting flowers in late winterand Solanum jasminoides for a mass of white summercolour. A specimen bonsai has been placed in the frontgarden and is surrounded by a low evergreen hedge tocreate a focal point when driving in to the property aswell as when viewed from the inside. 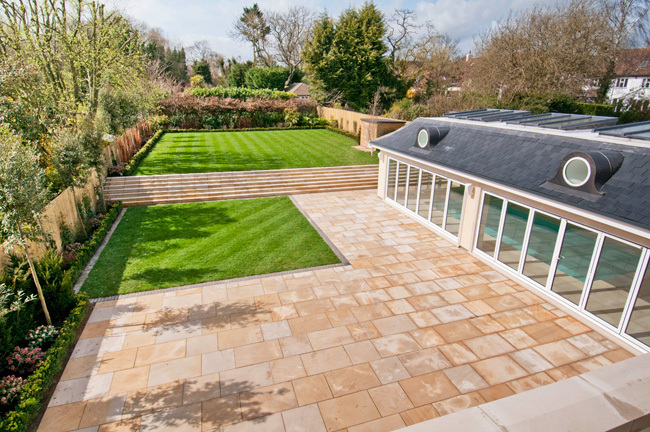 There is space for seasonal colour alongside the allseason planting and the gardens are designed to growand mature with the family that own the property. Thereis ample space for ball games and play and with a neatBox hedge running round the perimeter of the lawn abuffer zone for wayward footballs means that the plantsbeyond won't become damaged. The property is fitted with a Gigabyte networkinfrastructure and wireless connectivity via four 54 MbpsNetgear wireless access points. All RJ45 network pointsare patchable for Data, voice, VoIP and Power overEthernet. 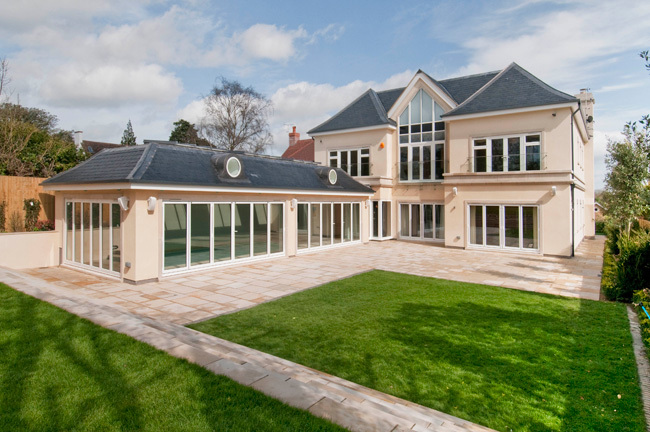 "Hydrothermal Underfloor Heating has been installedby a premium specialist to all three floors within theproperty as well as the pool complex. The Underfloor heating system is fed by an eco Gasboiler and occupies almost all of the floor area in theresidence giving maximum levels of comfort control. Each room has a fully programmable room thermostatto ensure that complete control is given and individualrequirements to individual areas and rooms are cateredfor. The Underfloor heating system extends to the poolcomplex to ensure continuity and warmth on coldwinter days and is fully programmable to allow the userto increase or decrease the floor temperature to therequired ambient level"
Luxury indoor swimming pool built by GuncastSwimming Pools Ltd, with overflowing spa / jacuzzi setwithin the pool. The pool is tiled with bespoke glass mosaics andfeatures underwater lighting. The spa features seatbubbler and hydro air jets. This is a 9m x 4m skimmer type pool. The walk-in wardrobes are supplied by a leadingmanufacturer of luxury designed walk-in wardrobesystems. 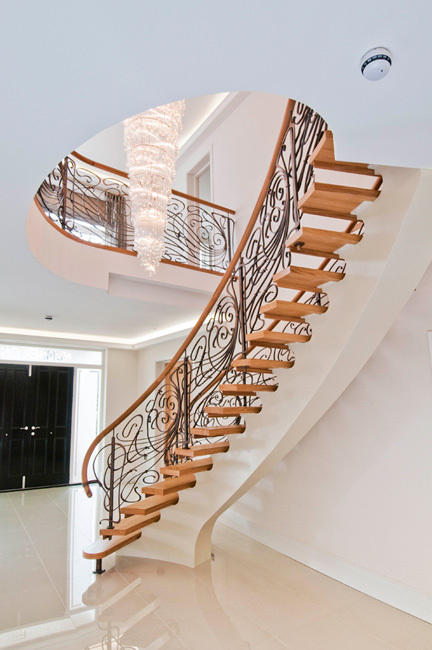 The product is built and designed to ahigh specification in the UK and is backed by themanufacturers 10 year guarantee. A contemporarydark wenge finish, combined with the solid silver steelframework, compliments the natural feel of the furniture.